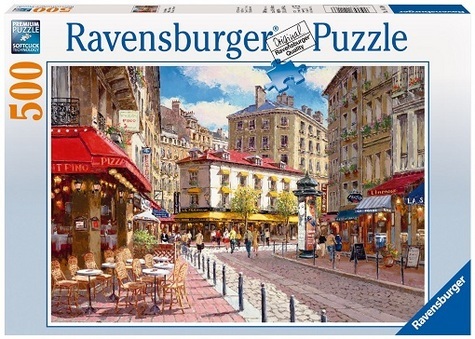 Format: Jigsaw Puzzle; UPC: 4005556141166; Brand: Ravensburger; Release Date: 2011; Pieces: 500 count; Size: approx. 19 x 14 inches; Ages: 12 and up. Condition: Like New. Purchased new and used once. All pieces accounted for, and everything is in excellent shape. Same box design as that shown here. Charming collection of colorful shops in France are featured on 500 piece jigsaw puzzle, with finished size of 19" x 14". Created by Ravensburger, premium puzzle features softclick technology so that when complete, your puzzle is smooth and fits together perfectly. Fun and relaxing family or group activity, or enjoy it on your own. Made in Germany. Priority Mail delivery for this item costs $40.00 at the request of a buyer. Otherwise, the shipping rate given here applies to orders shipped either First Class or Media Mail (depending on product type and package size) within the U.S. only. Orders consisting of multiple purchases packaged together ship by any of these delivery methods at a discounted rate, usually for only $1.00 per additional item plus the shipping fee for the first item (determined to be the one with the highest delivery charge). International buyers: please contact us with your destination country for applicable base shipping rates. Multiple purchases that are packaged together save shipping costs for you, too!